Fire Wednesday afternoon gutted the home of Mr. Sunny Ajose, the former Lagos State Head Of Service and special adviser to Governor Raji Fashola. The incident happened at Abisogun Leigh Street, Ogba, Lagos, southwest Nigeria. 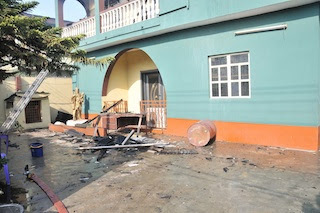 The fire was said to have been caused by power surge after Power Holding Company of Nigeria, PHCN, restored electricity supply to his one storey building. Only one of the flats was affected as fire fighters from the Lagos State Fire Service raced to the scene and put it out before it could spread to other flats. Speaking to P.M.NEWS about the disaster, Mr. Ajose thanked God that no life was lost. He also thanked his neighbours who assisted in putting out the fire.